If you keep your car for as long as I do, you will no doubt have to deal with cloudy headlight lenses. Older cars used sealed beam glass headlights but newer cars use a polycarbonate (plastic) headlight assemblies that have a replaceable halogen bulb. Most manufactures coat the polycarbonate with a UV coating that acts as a “sunscreen” for the plastic. Over time this coating wears thin and then the sunlight damages the surface of the plastic. 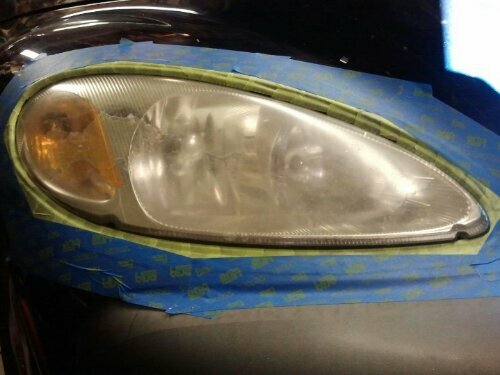 There are many companies that claim to restore your headlight lens “by just wiping on” their product. The problem is they don’t resolve the problem of the damaged surface. This damage is not only cosmetic, but decrease the amount of light your headlights put on the road. The damaged surface defuse the light in all directions, including back into the headlight, which makes seeing the road more difficult. After much research I decided on a headlight restoration kit by 3M. It has several different abrasives to restore the surface. The only tools you need is a low RPM drill motor and a spray bottle with water. It also takes some patience to mask the headlight and sand the lens surface. 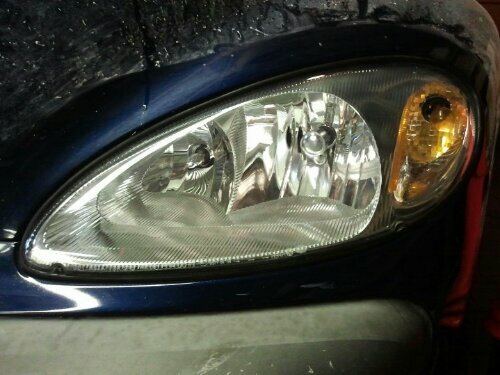 It took me about three hours to restore these two PT Cruiser headlights. Due to the fact the factory protective coating has worn out, and been removed during the restoration, you will need to use a plastic polish on a regular basis to keep the headlight surface protected.